Port Elizabeth - South Africa will look to ride on the success of the T20 series, according to stand-in captain Faf du Plessis, as they go into the Test matches against New Zealand. Du Plessis said they looked forward to defending their number one position in the longest format of the game when the first of two Tests starts in Cape Town next week. "Test cricket is such an awesome test of skill and we are all looking forward to the longer version of the game," he said. "We are number one in the world now and we don't want to let the standards we've set slip. "Personally, I'm really looking forward to joining up with the Test team again because it's such a special place to play Test cricket. I haven't played a home series in Test cricket so I can't wait to get to Cape Town." Reflecting on their Boxing Day clash in the short format, Du Plessis was full of praise for South Africa's latest additions to T20 cricket - spin bowler Aaron Phangiso and top-order batsman Henry Davids. Phangiso, after bowling four overs for 42 runs without success on debut in East London in the second T20I, bounced back superbly to pick up 3/25 in Port Elizabeth, including the big wickets of Martin Guptill and Brendon McCullum. "It was obviously very rewarding for him when he got that first wicket. You could see the nerves settle a bit and then after that he was just his old self and he bowled really well. "I'm very chuffed for him and he showed good character after coming back from his first game where he took a bit of tap." "I think it's a good sign for cricket. Henry's done really well for the last year now. He had a good Champions League and obviously drew confidence from that. "He plays really good cricket shots and puts the bowlers under pressure." 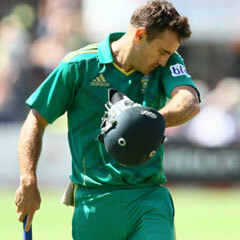 Du Plessis was pleased with the way South Africa responded after the loss in East London. "I thought we came back very nicely with the bat, especially when you've got a couple of young guys who are new to international cricket. "After losing two wickets early up front our guys showed good composure and posted a really good total. I thought the bowling was excellent throughout the series. We bowled well most of the time. "I believe we deserved to win the series. I thought we were very unlucky in the second game." The Black Caps play a three-day tour match against an SA Invitational XI in Paarl starting on Friday.